Many guitarists of the late 60s and early 70s knew how to get a rough earthy and unmistakable sound out of their humbucking pickups and tube amplifiers, which in retrospect has not been possible to recreate so far. Representative guitarists’ names are Luther Grosvenor, Henry McCullough, Steve Marriot or the incomparable Ron Wood. Now BSM has dedicated a special Booster to this sound, so as to receive this historical sound with every tube amp, that offers a powerful clean or crunch character. The RW-F has been specially designed for classical medium power pickups like the PAF or P90, also the Mini Humbucker or fat overwound single coils. Especially the neck Humbucker, which often tends to sound muddy with inappropriate amp control settings, stays clear now with an unheard warm balance between bass and treble, when using the RW-F. The bridge Humbucker becomes tight and definite with great punch. One Gain-control is enough! It enables you to blend from a slightly earthy crunch to a creamy blues till fat modern. Everything is permitted. If the guitar’s volume pot is slightly rolled back, you will get the typical earthy crunch of times long gone. 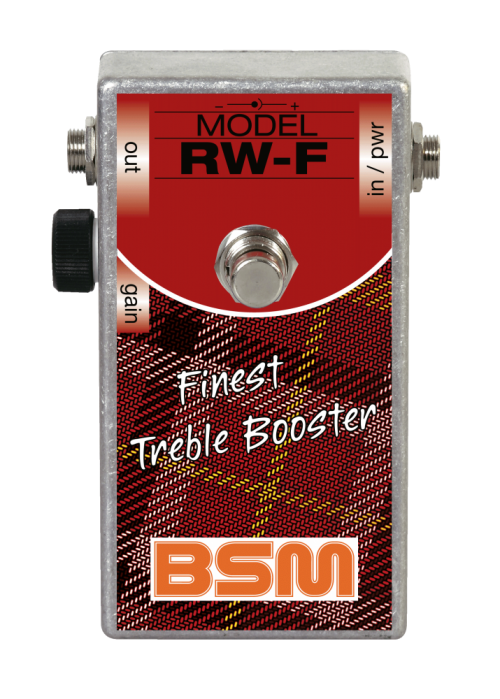 The RW-F Booster is inserted between guitar and amplifier, not into the FX loop. The magical tone is achieved by the interaction between guitar pickup, booster and amplifier. A 9V battery with a current consumption of approx. 250 uA powers the unit. Because of the external DC jack, you can power the RW-F with 9volts as well as with 18 volts for increased headroom. The average output level is 5dBm, the maximum output voltage when the strings are struck really hard is 4V max. Note: The negative pole of the battery is ground! If you have any questions concerning our products, especially the BSM RW-F Treble Booster, our tech-head and mastermind Mr. Bernd C. Meiser would be happy to talk to you. So don't hestitate any longer and send him an email to info@treblebooster.net or use the contact form to contact him.